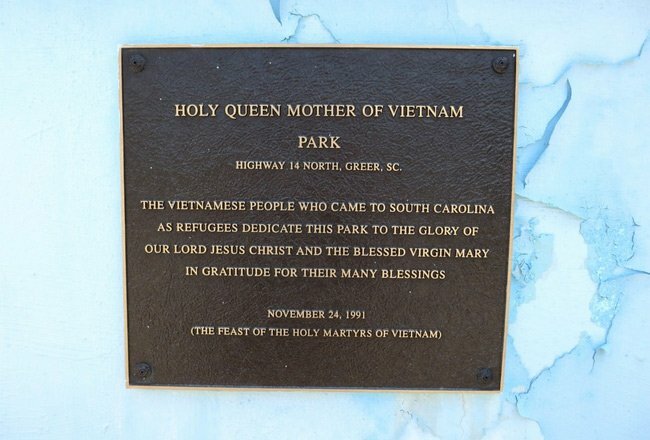 This holy park off South Carolina Highway 14 in Greer was built by Catholic refugees who came to South Carolina from Vietnam. The sacred space was dedicated on November 24, 1991, during the Feast of the Holy Martyrs of Vietnam, which celebrates the canonization of 117 Vietnamese martyrs. The martyrs represent all those persecuted for their faith in Vietnam during the eighteenth and nineteenth centuries. There are currently around seven million Catholics in Vietnam, and one million Vietnamese Catholic expatriates worldwide. The park was built to honor Jesus and the Virgin Mary for the blessings received by the refugees. Its centerpiece is a shrine, pictured above and below. The shrine features statuary of the Virgin Mary and the Christ child. 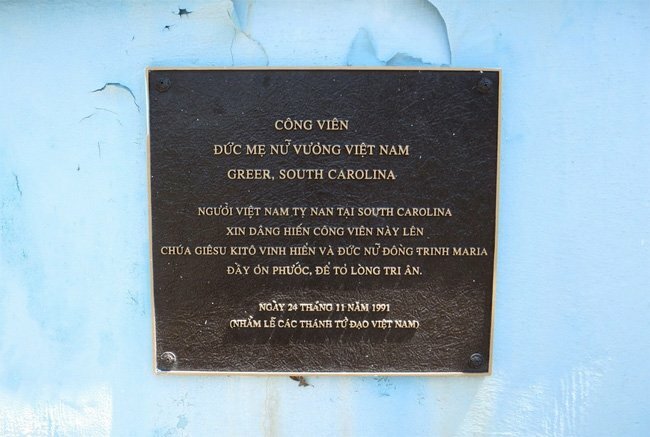 On either side of the shrine is a plaque denoting the dedication of the park; one plaque is written in English, while the other is in Vietnamese. The plaques are pictured below flanking the statuary, and they are also pictured in detail at the bottom of this page. 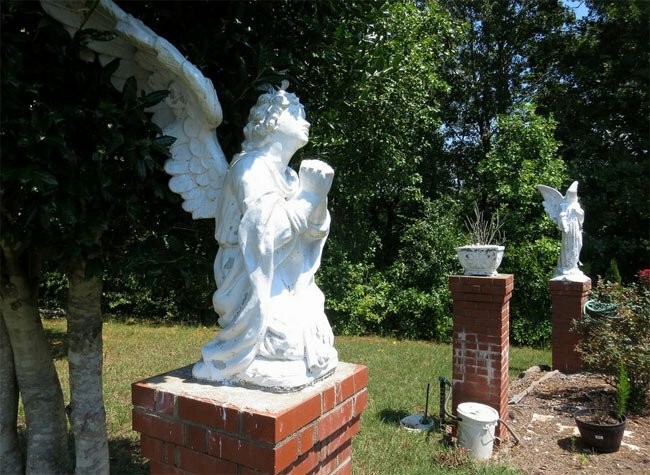 Other statues of angels surround the park and guard the shrine, as seen below. The park is unusual for this part of the rural Upstate and has become a roadside destination for travelers headed to the Blue Ridge escarpment. While many visitors are simply curious about the shrine, others stop to pay their respects. A picnic area, complete with several tables, is located beneath a shady tree. 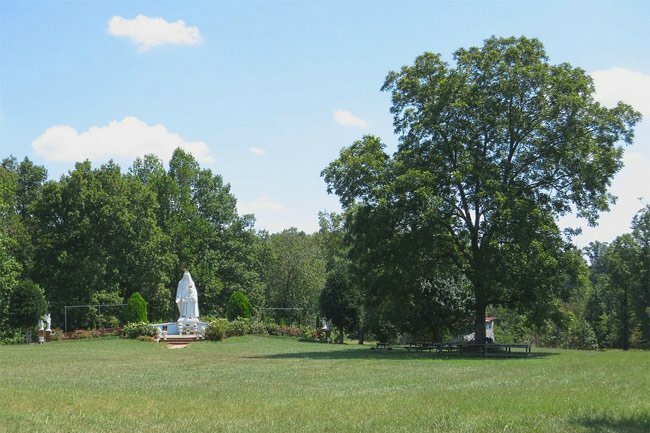 Though the park is located across from Skyland Elementary School, it is nonetheless a quiet, serene spot for prayer and contemplation. 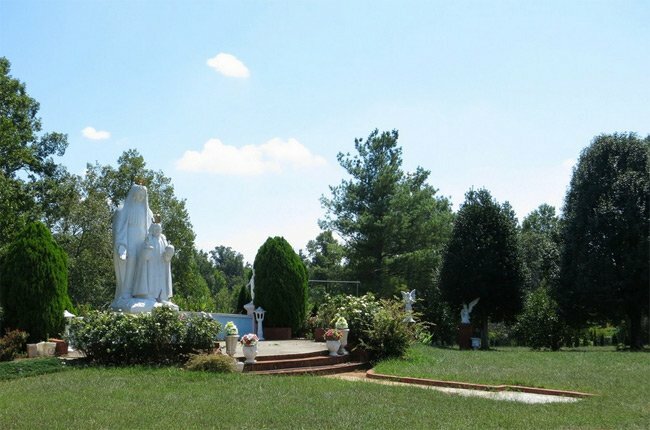 Surrounded by the rolling hills of the Piedmont, the shrine is immersed in solitude. The park is owned and maintained by the Catholic Diocese of Charleston. On October 9, 2005 the park was blessed by Bishop Robert J. Baker, who was appointed to the Diocese of Birmingham in Alabama in 2007. Bishop Baker was replaced in Charleston by Bishop Robert E. Guglielmone in 2009. Though the park and shrine are protected by an iron fence, people are invited to the explore the grounds respectfully. 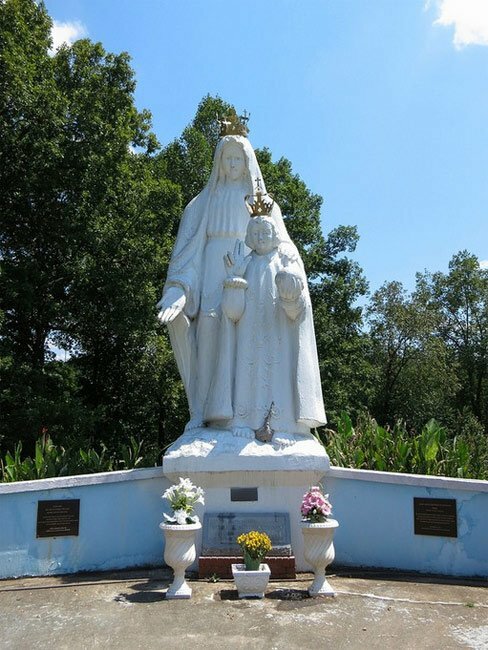 Each May a celebration takes place at the park in honor of the vision of Mary that appeared to Catholics suffering persecution in Vietnam in 1798. The event includes the praying of the rosary, dancing, a procession, and a picnic. A diverse group of Catholics from the surrounding area and North Carolina attend the celebration, which is typically led in both English and in Vietnamese. Many thanks to Tyler Chapman of Simpsonville for providing the above photos and much of the information. Very nice place to reflect on oneself and show honor. In the 1990s in Conyers, Georgua on Good Friday my grandmother’s silver communion beads turned to hold while praying the rosary in the house on the property where the blessed mother gave her messages. I will never forget what happened that day. It was many years before as a child that mother Mary appeared to me when a statue came alive as I knelt before her. Seeing the statue in Greer reminded me that she is ever watchful and always our mother.